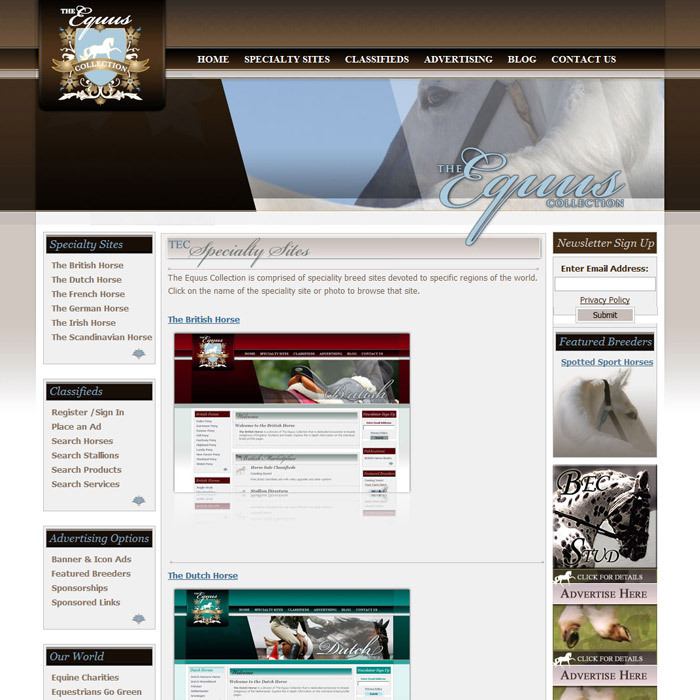 the value of everything you do. 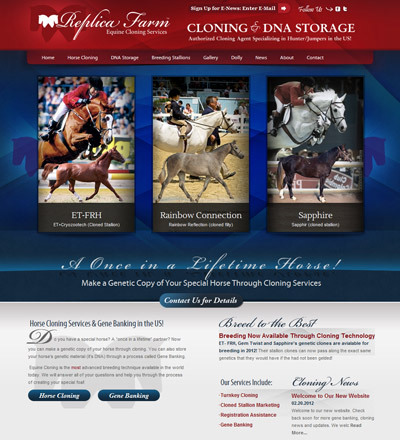 Replica Farm offers the most advanced breeding technique available in the world today: equine cloning. 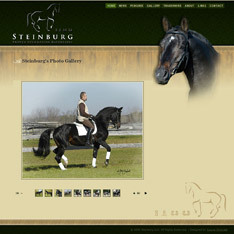 For years owners of high performance show horses have wished there was a way to replicate them. 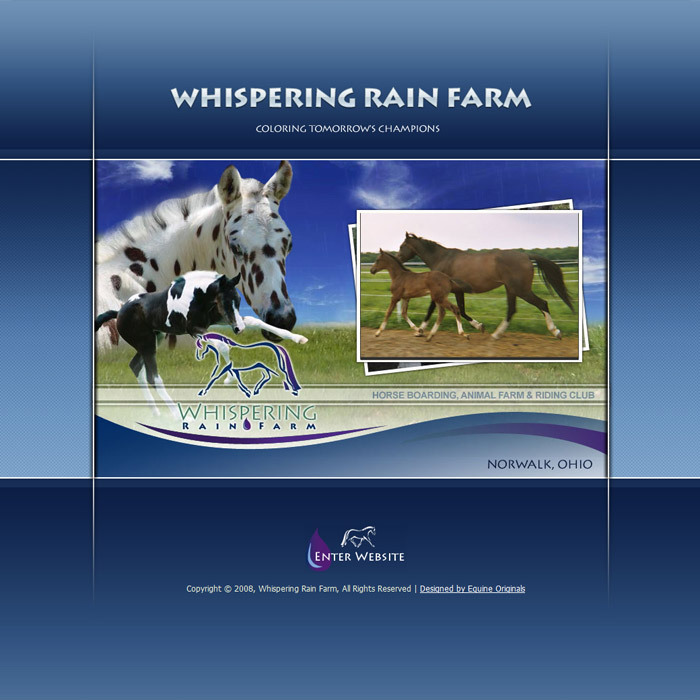 The reasons range from developing future champions, protection from loss – even to generate a horse very similar to a loved one. 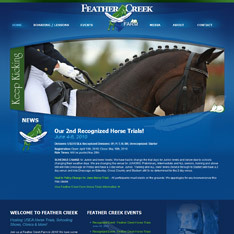 Now there is a way to do it! 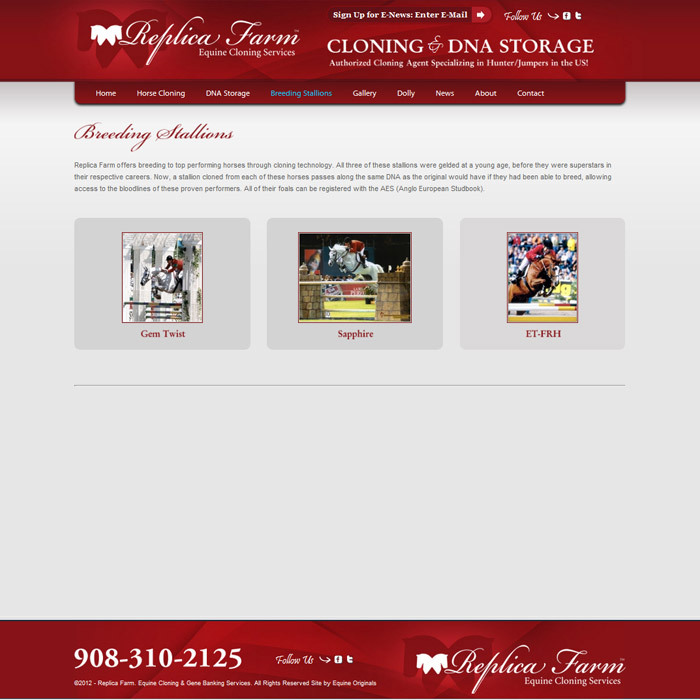 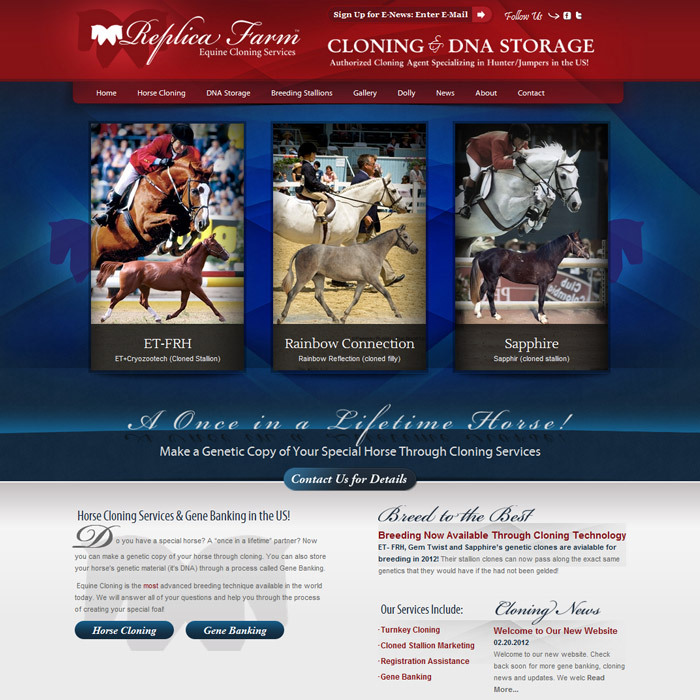 Replica Farm is the only company in the world providing commercial equine cloning services and has successfully cloned the most horses by any company or research institute in the world. 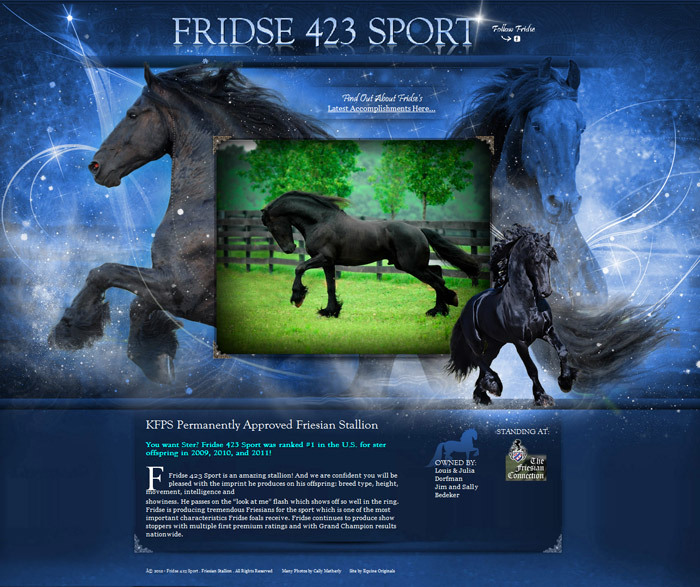 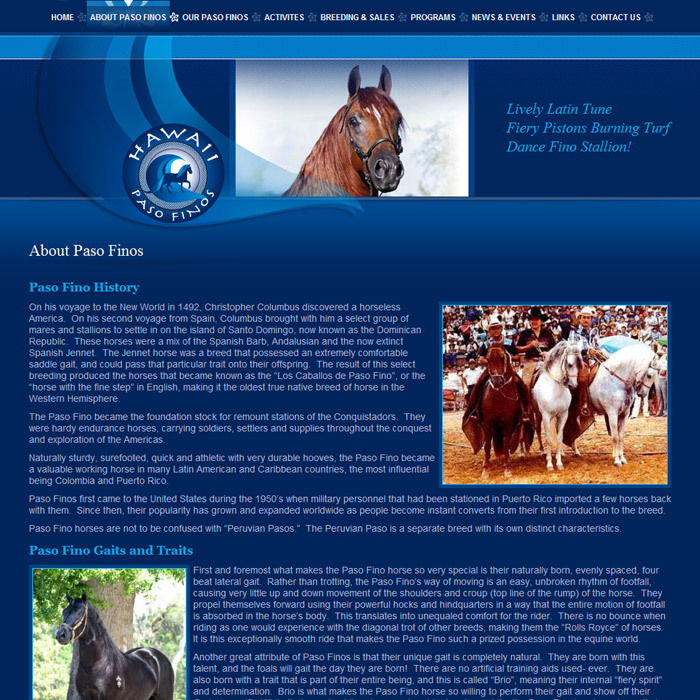 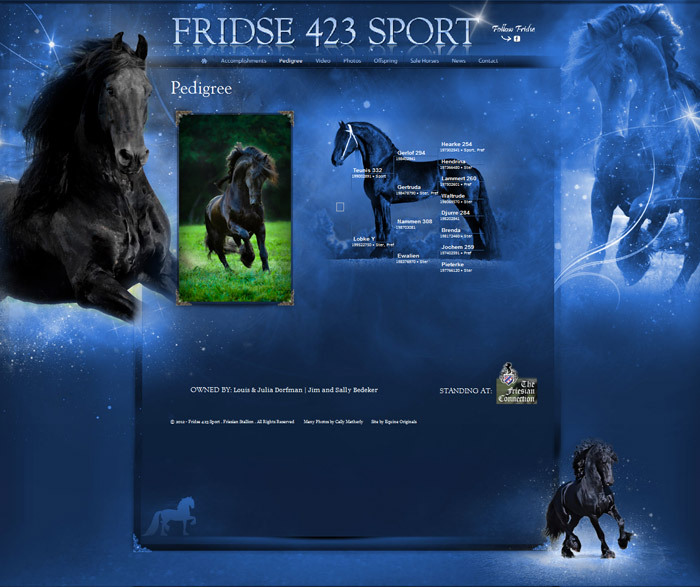 The website of Fridse 423 Sport, an amazing stallion that passes stellar breed type, height, movement, intelligence and showiness to his offspring. 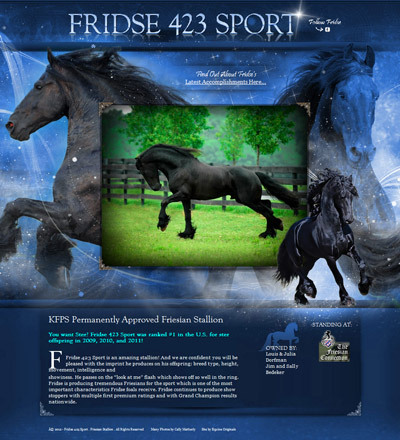 Fridse is producing tremendous Friesians for the sport and continues to produce show stoppers with multiple first premium ratings and Grand Champion results nationwide. 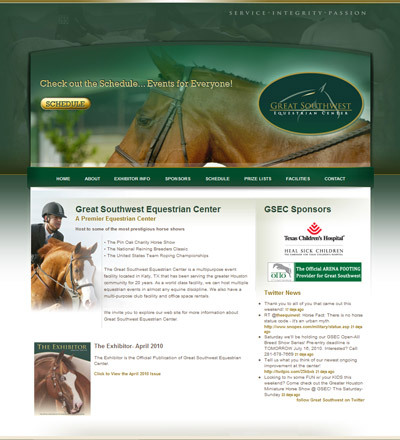 The Great Southwest Equestrian Center is a multipurpose event facility located in Katy, TX that has been serving the greater Houston community for 20 years. 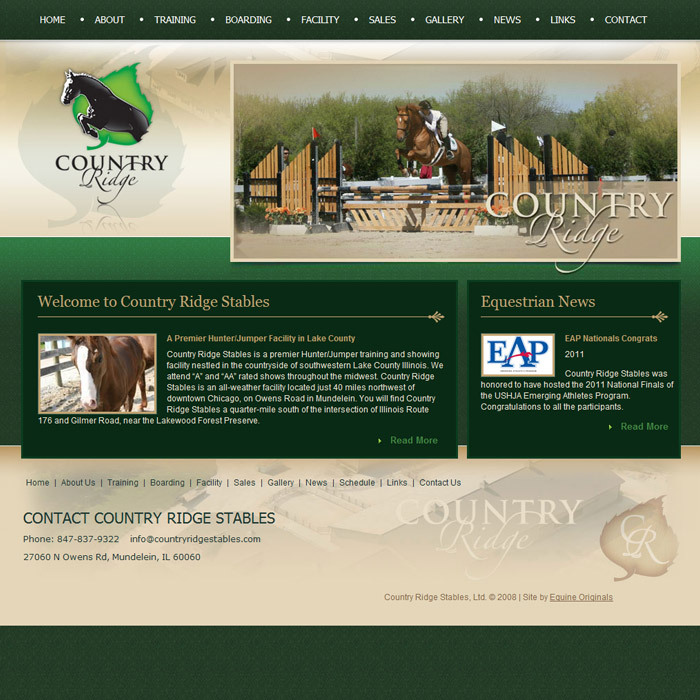 As a world class facility, they can host multiple equestrian events in almost any equine discipline. 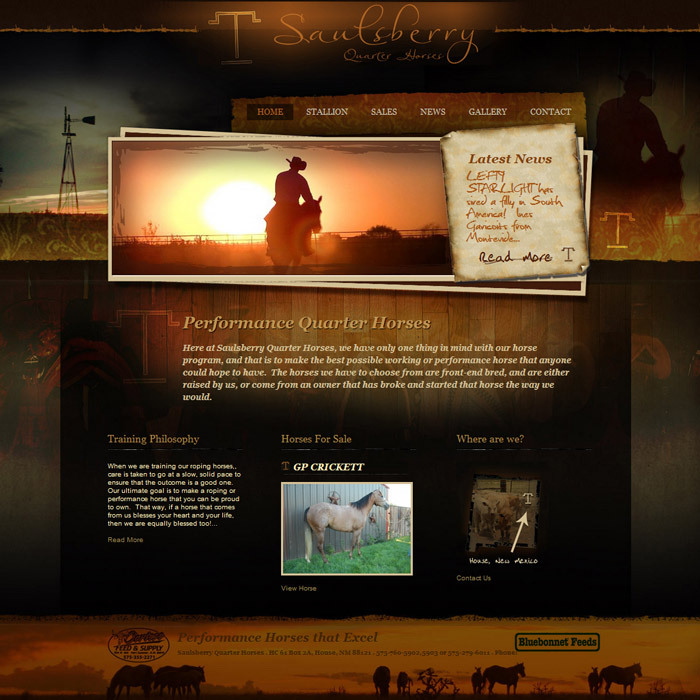 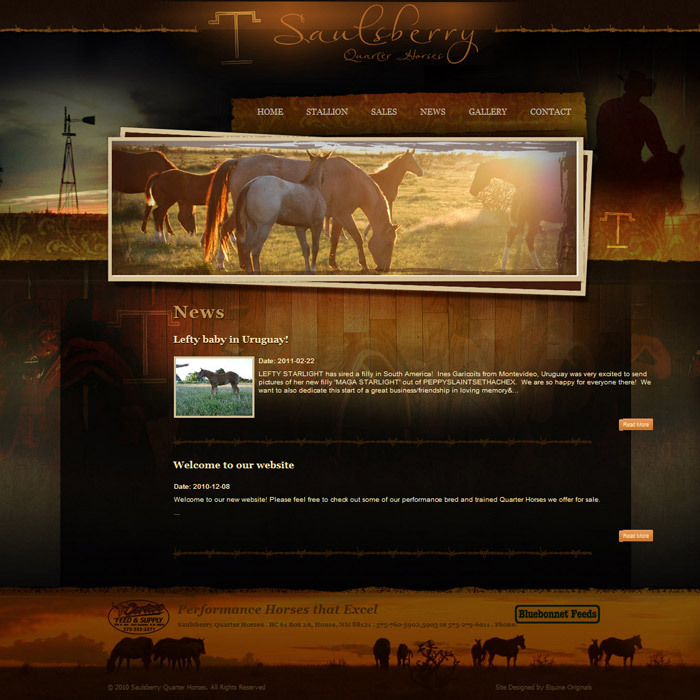 "Here at Saulsberry Quarter Horses, we have only one thing in mind with our horse program, and that is to make the best possible working or performance horse that anyone could hope to have. 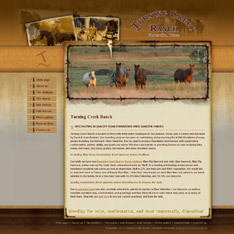 Care is taken to go at a slow, solid pace to ensure a good outcome. Our ultimate goal is to make a roping or performance horse that you can be proud to own." 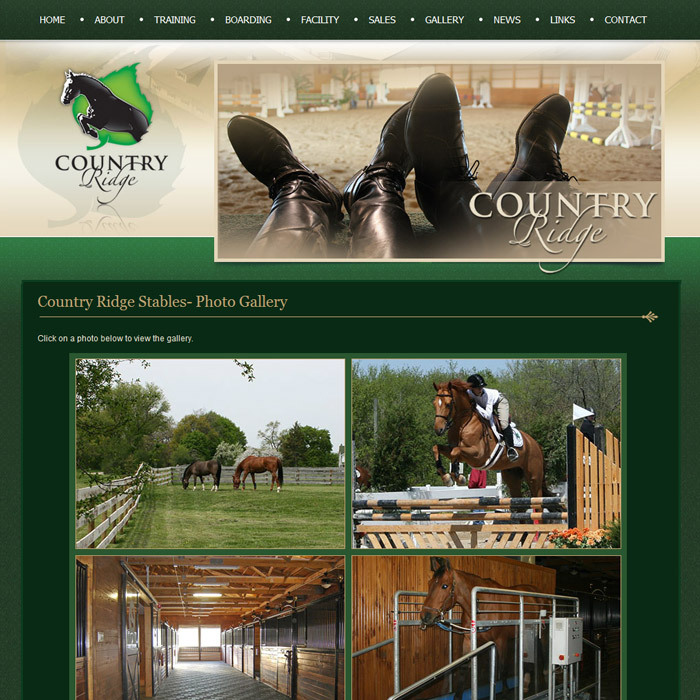 Country Ridge Stables is a premier Hunter/Jumper training and showing facility nestled in the countryside of southwestern Illinois, with students attending “A” and “AA” rated shows throughout the midwest. 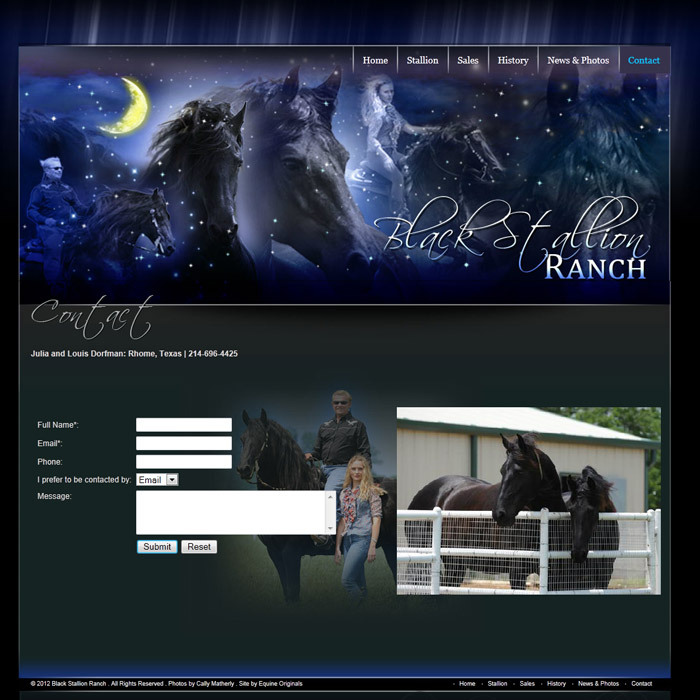 The facility features a beautiful 38 stall heated barn with two roomy 24’ x 24’ tack rooms, 2 full service grooming stalls and 2 wash stalls with hot and cold water, among other things. 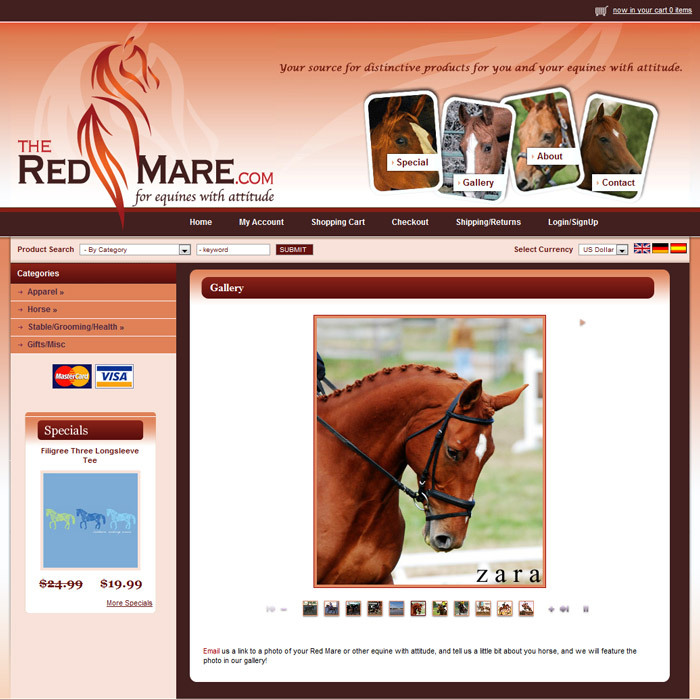 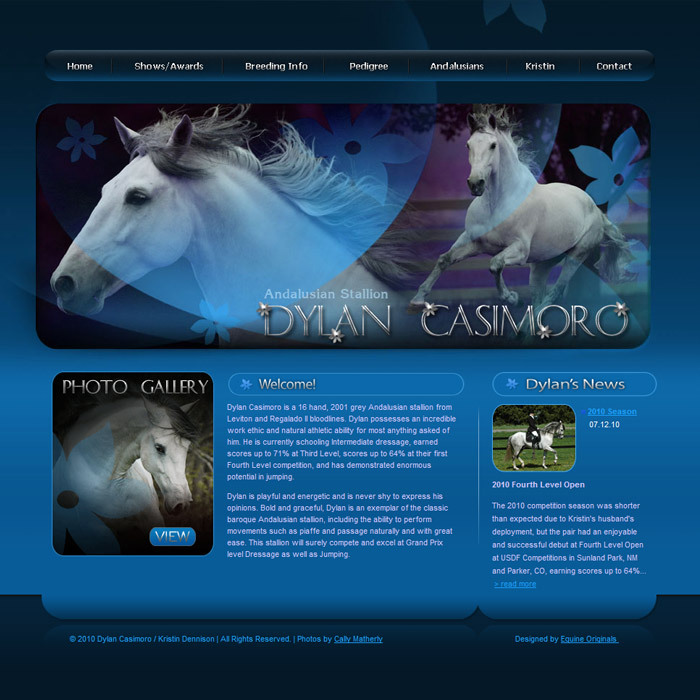 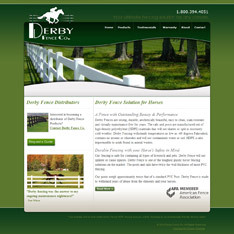 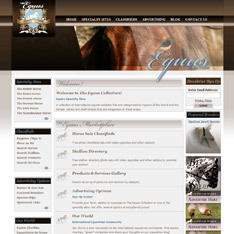 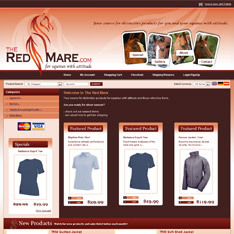 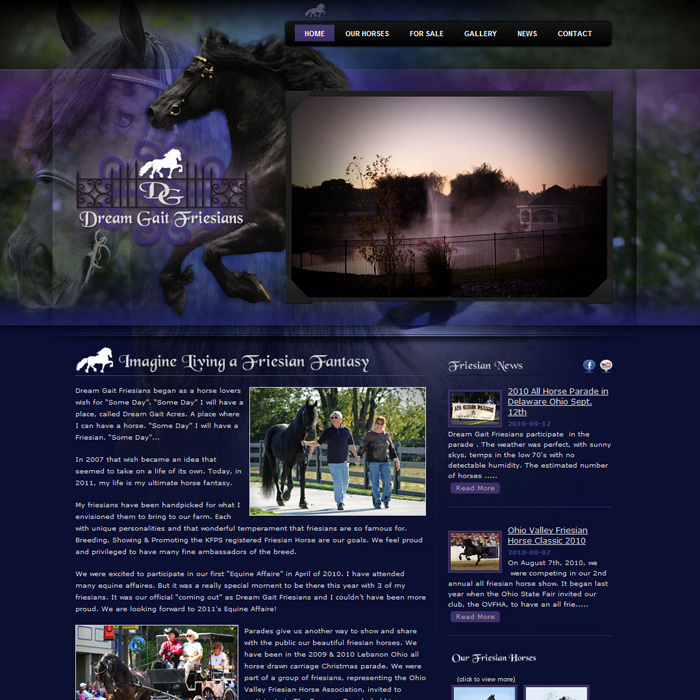 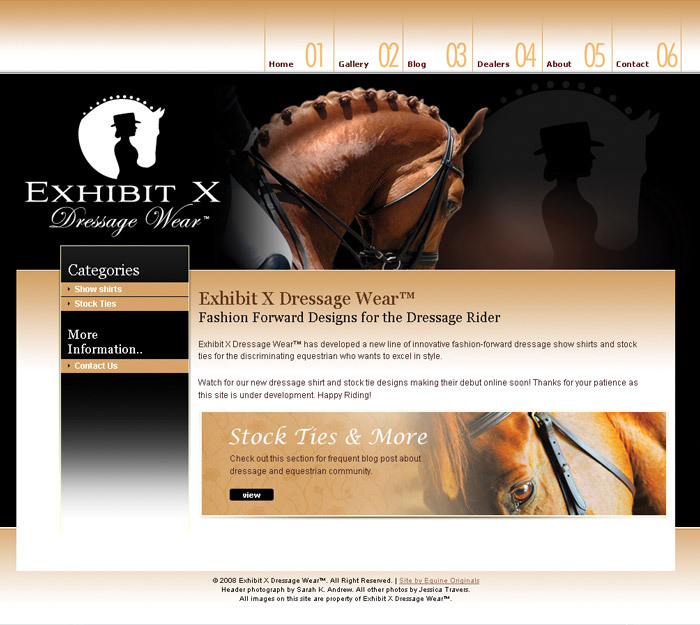 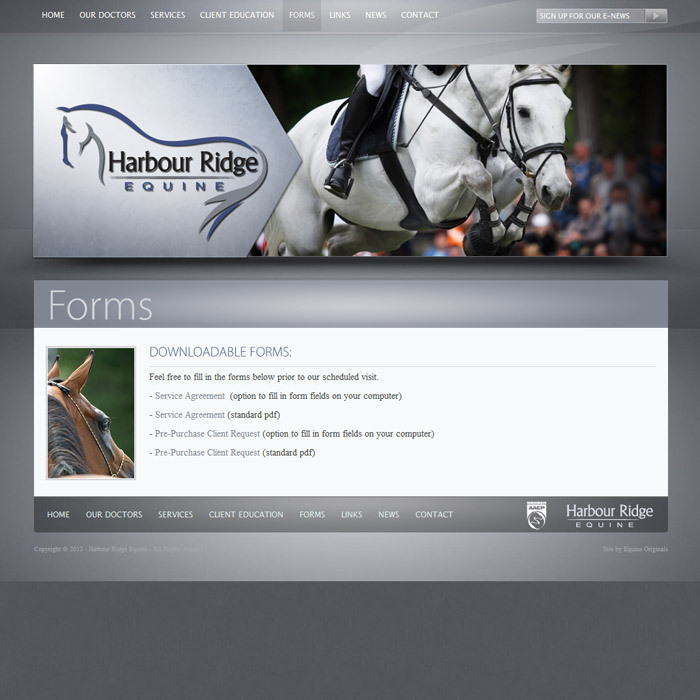 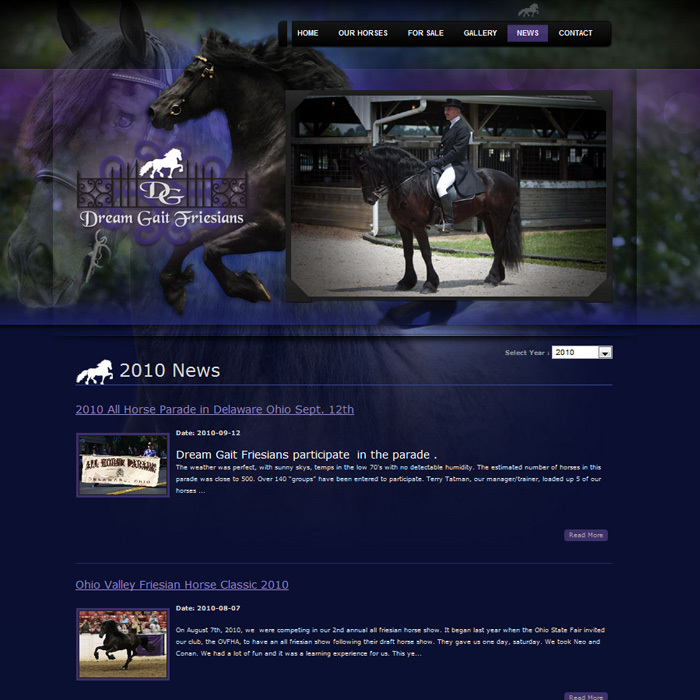 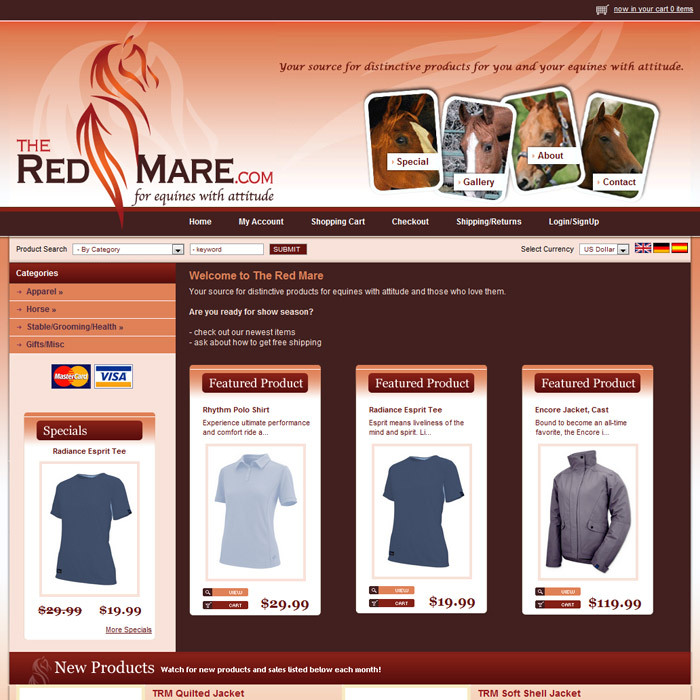 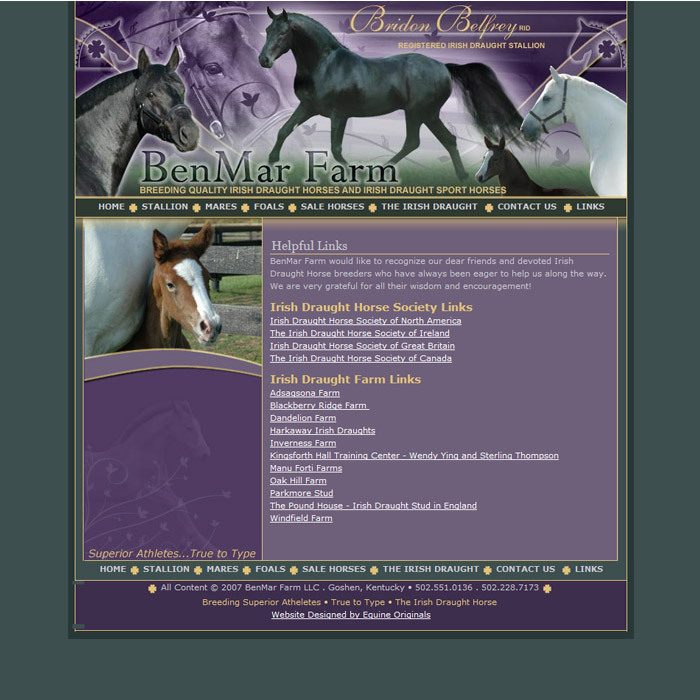 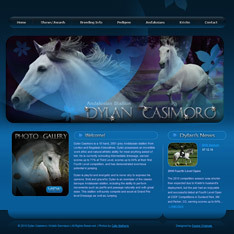 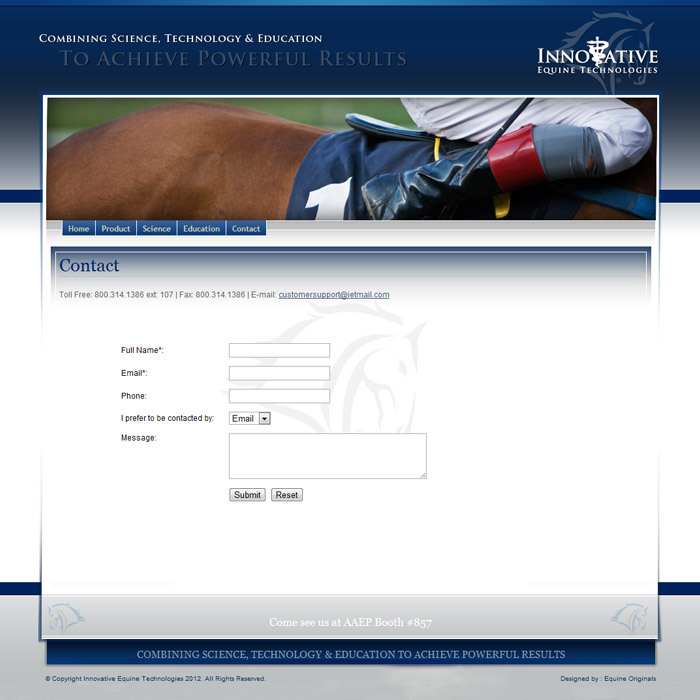 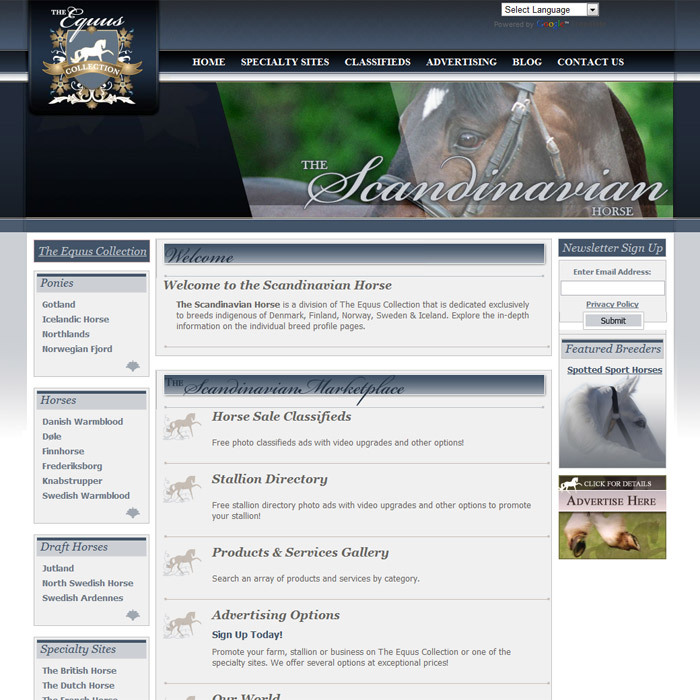 Interested in having your own high quality Equine Website? 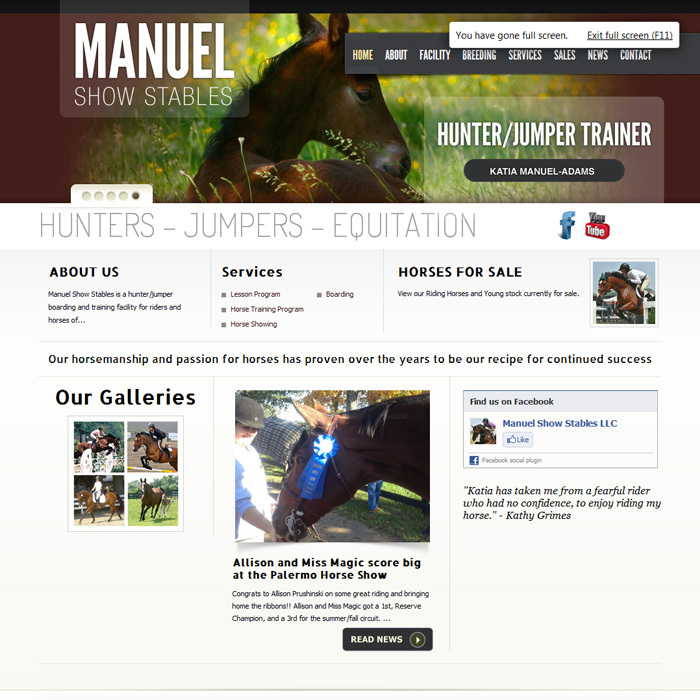 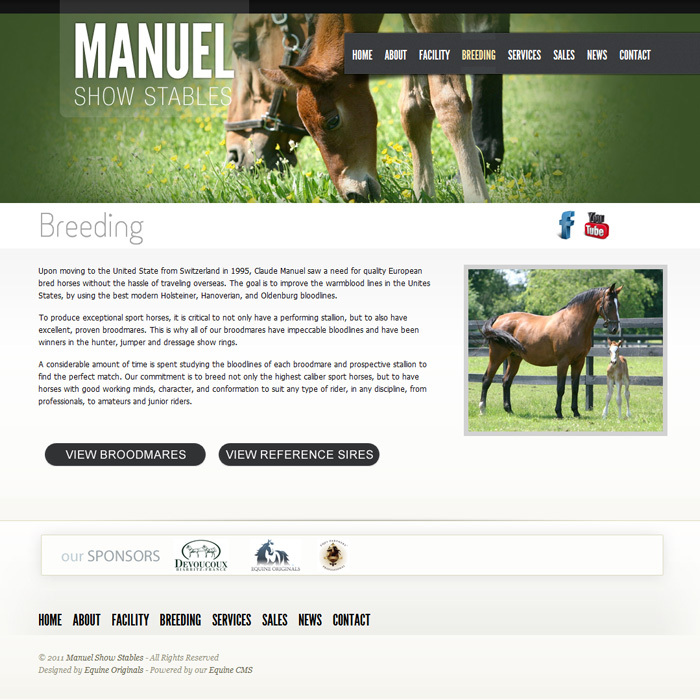 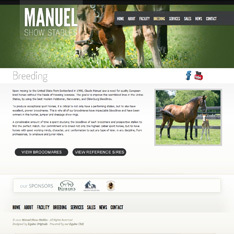 Manuel Show Stables is a hunter/jumper boarding and training facility for riders and horses of all levels. 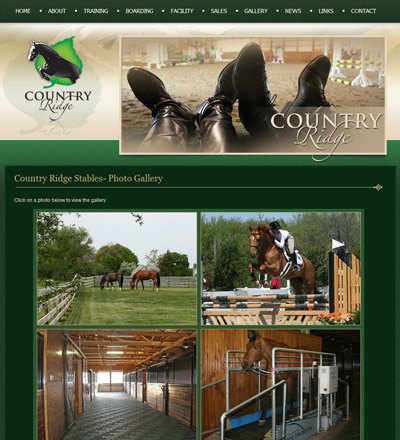 This premier facility offers indoor and outdoor riding rings, lush pastures, large stalls, and a fun family atmosphere. 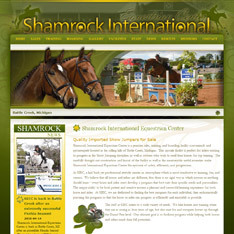 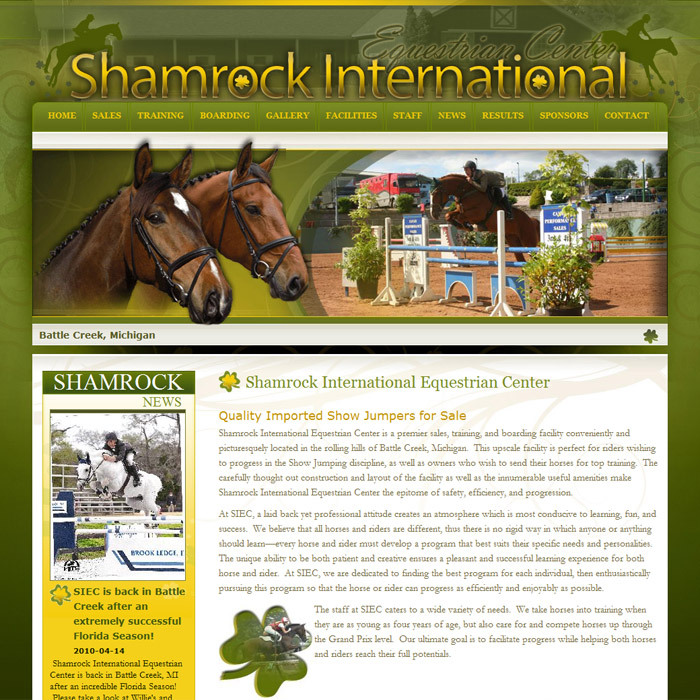 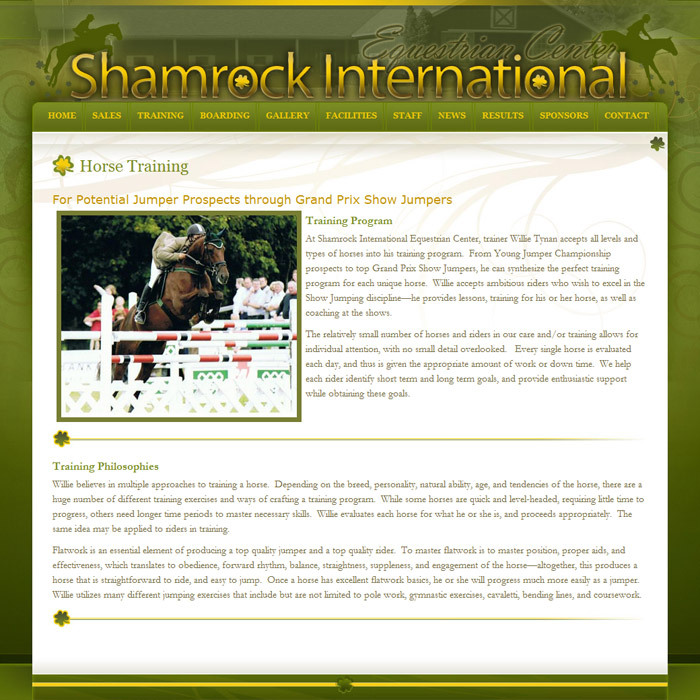 Shamrock International Equestrian Center is perfect for riders wishing to progress in the Show Jumping discipline, as well as owners who wish to send their horses for top training. Harbour Ridge Equine is a full service equine mobile veterinary practice based in Palm City, Florida. 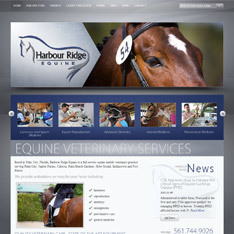 Using state of the art equipment and techniques, they take pride in their dedication, compassion and professionalism in veterinary medicine. 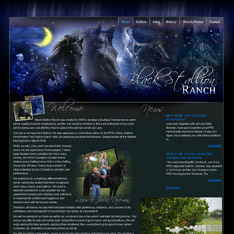 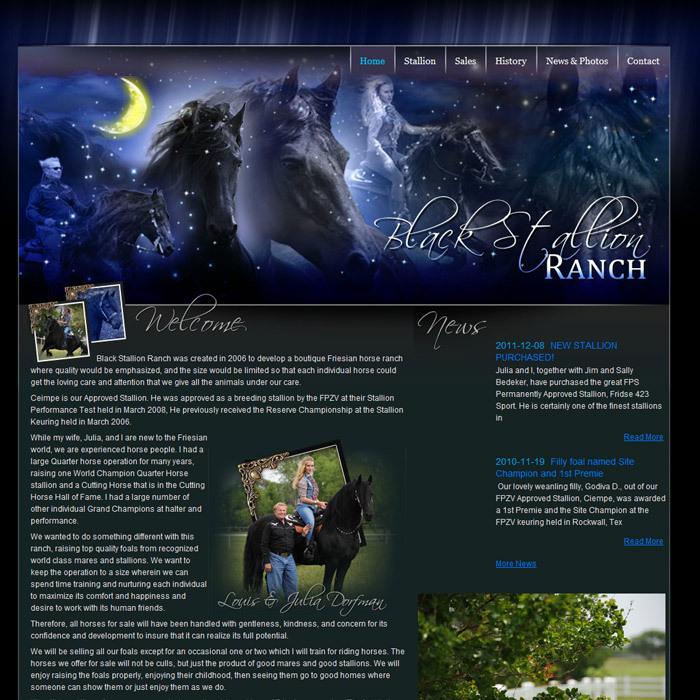 Black Stallion Ranch was created in 2006 to develop a boutique Friesian horse ranch where quality would be emphasized, and size would be limited so every horse could receive special loving care and attention. 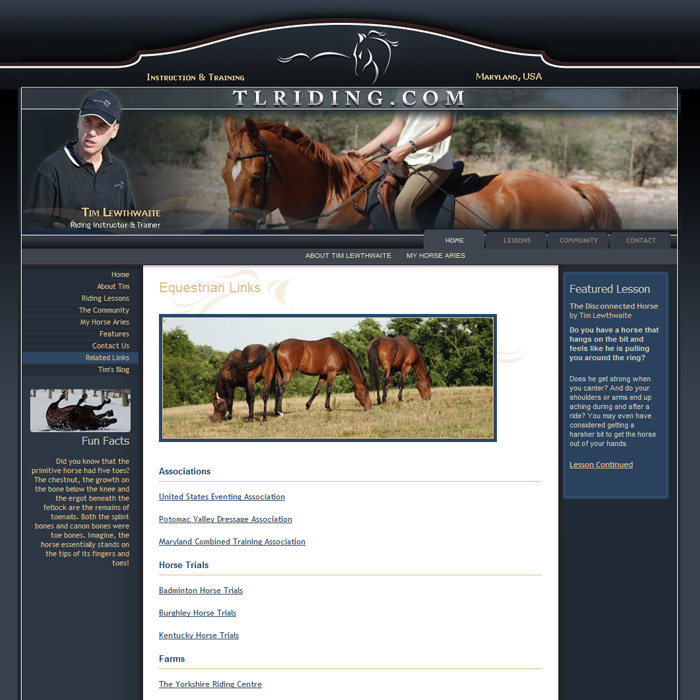 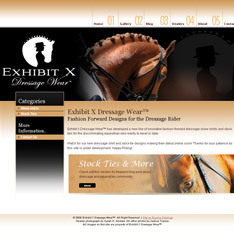 TLRiding.com was founded by Tim Lewthwaite, a riding instructor in Maryland. 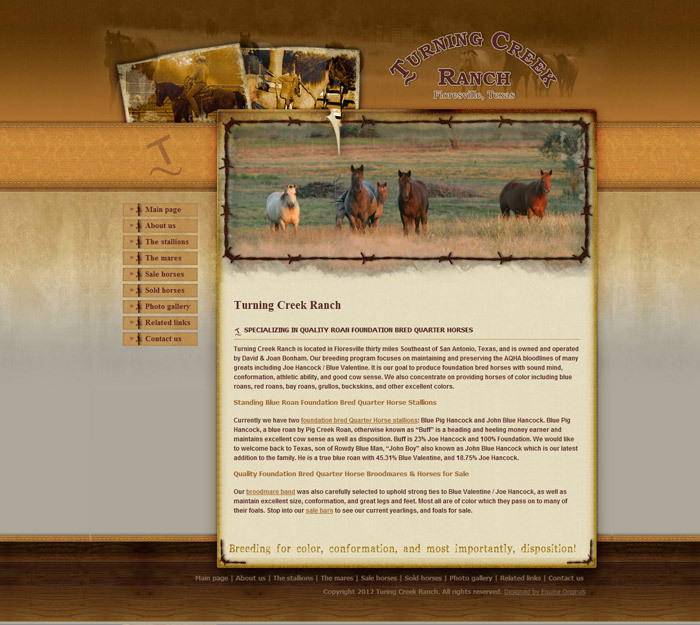 The site provides useful lesson plans, interesting photography, and a sense of community to both Tim's students and online visitors who happen to find his site. 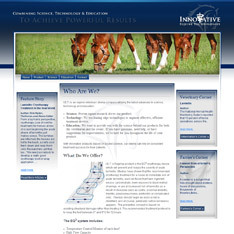 Innovative Equine Technologies is an equine veterinary device company utilizing the latest advances in science, technology and education. 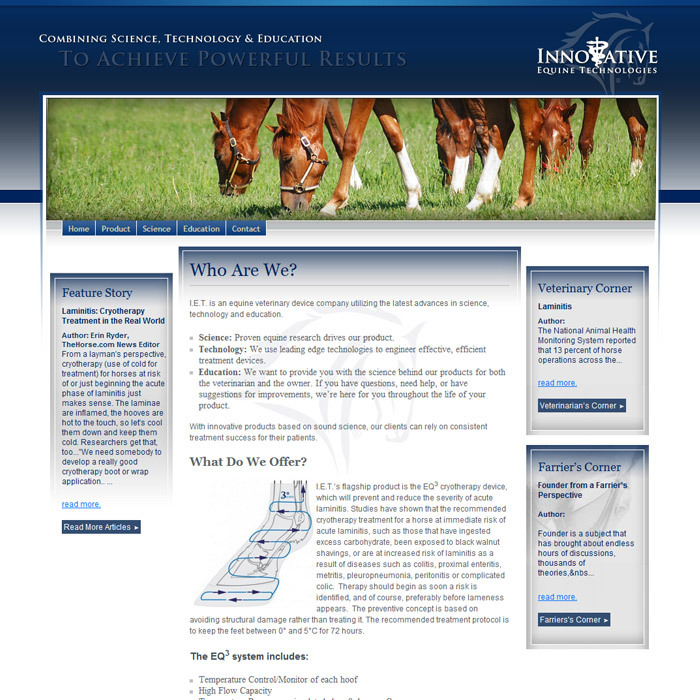 With products based on sound science, clients receive consistent treatment success for their patients. 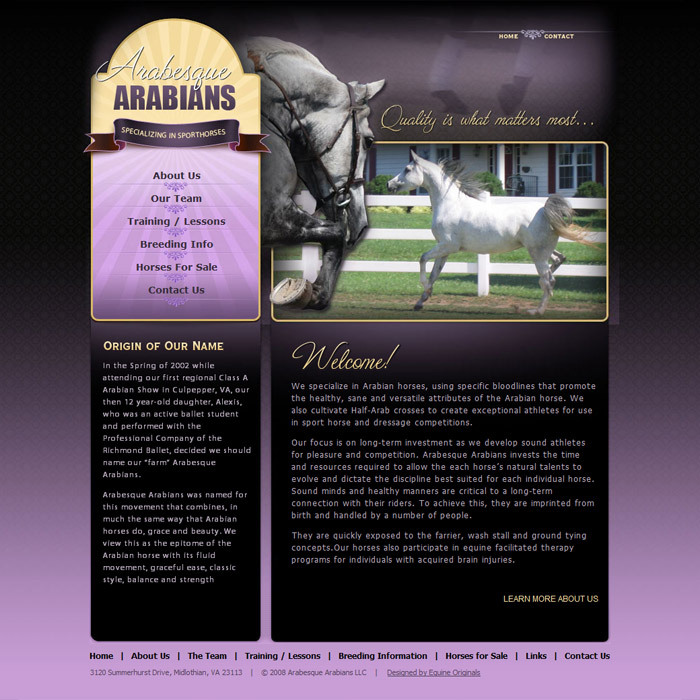 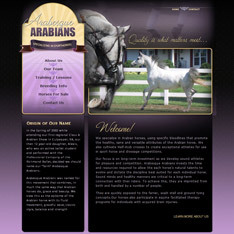 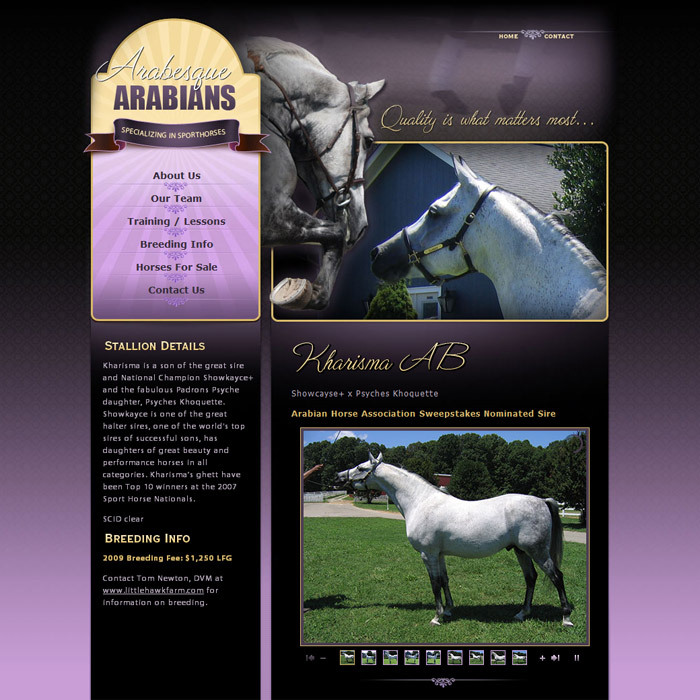 Arabesque Arabians focuses on breeding Arabian horses, using specific bloodlines that promote the healthy, sane and versatile attributes of the Arabian Sport Horse. 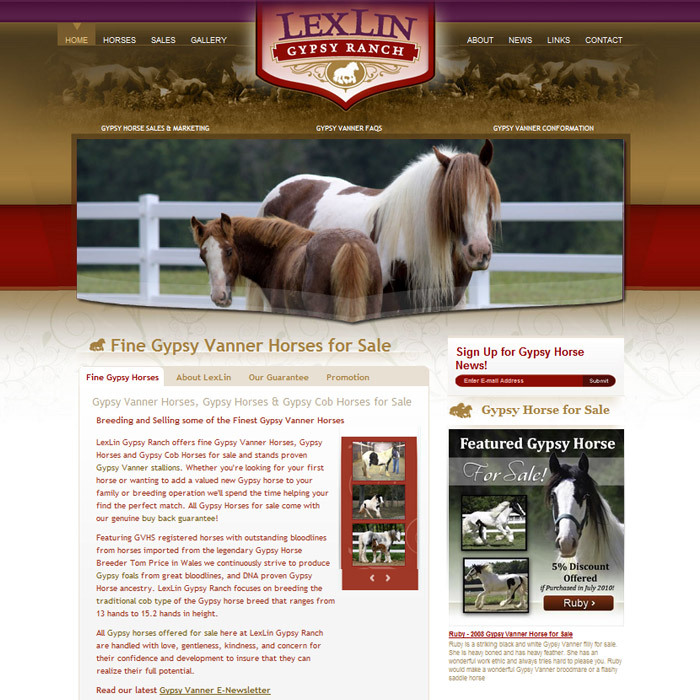 Lexlin Gypsy Horse Ranch's scenic pastures are filled with the 140+ of the finest Gypsy Vanner Horses. 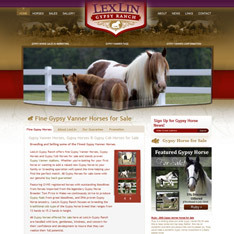 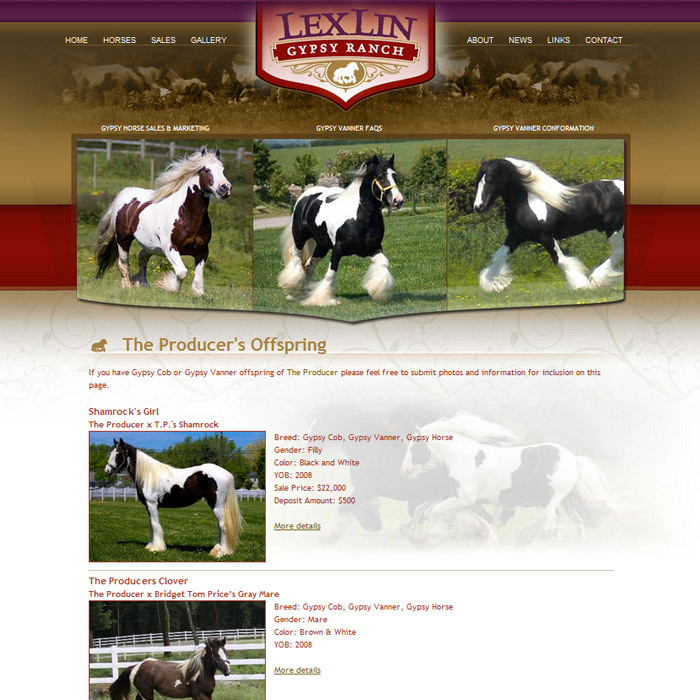 Lexlin offers fine Gypsy Vanner Horses for sale and stands proven Gypsy Vanner stallions. 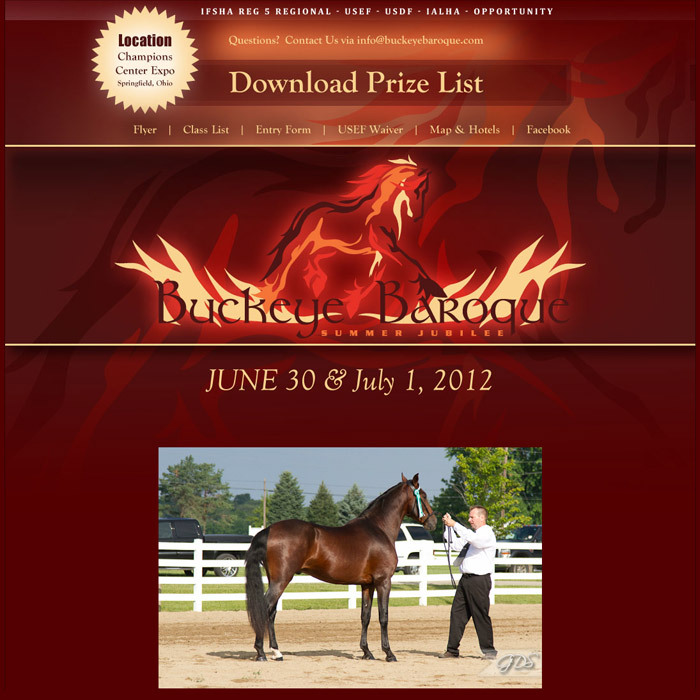 The Buckeye Baroque Summer Jubilee is an annual Regional show featuring classes for: Friesians, Andalusians/Lusitanos, and Part-Breds. 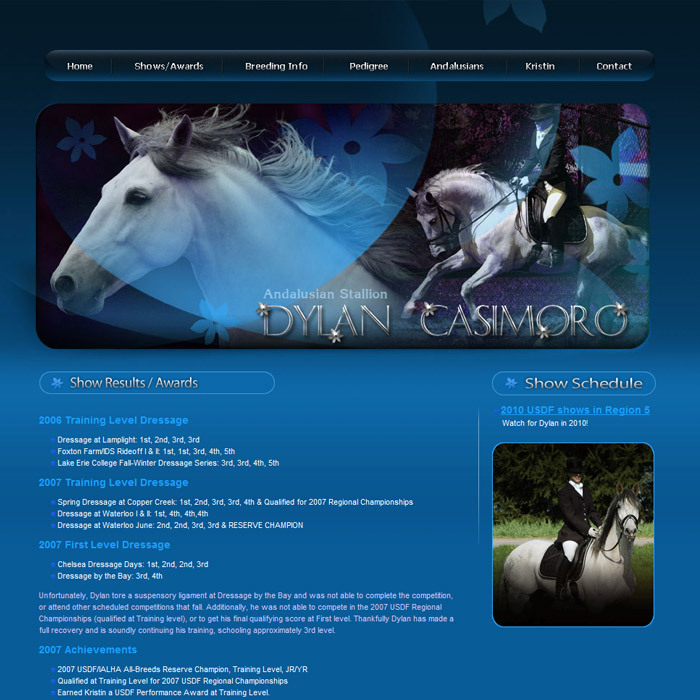 All offering Opportunity classes open to all breeds and USDF approved Dressage classes. Red Horse Stables provides professional and certified instruction in western pleasure, hunter/jumper, dressage and eventing. 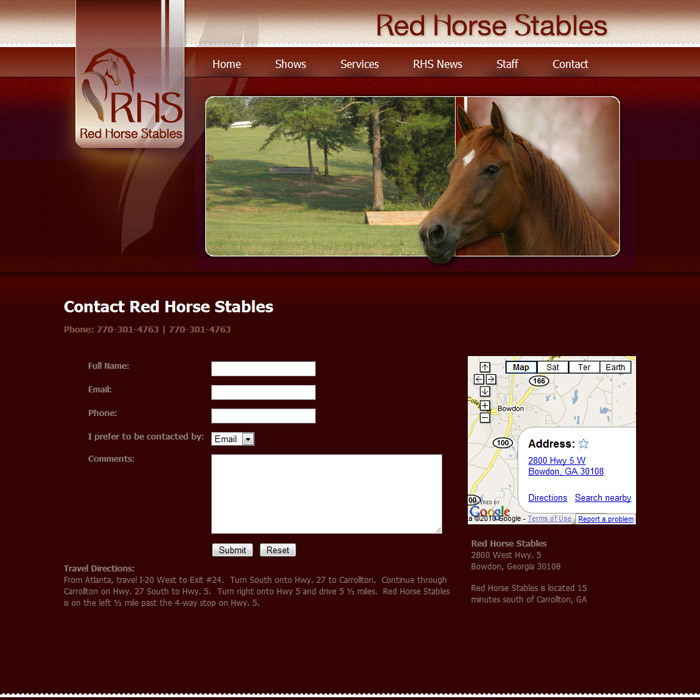 At their 160 acre facility in Tyus, GA, Red Horse Stables offer full and pasture board in a fun and safe environment to provide the best care possible for your horse. 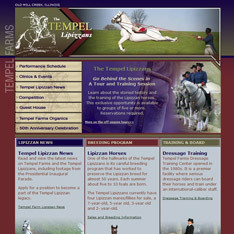 One of the hallmarks of the Temple Lipizzans is its careful breeding program. 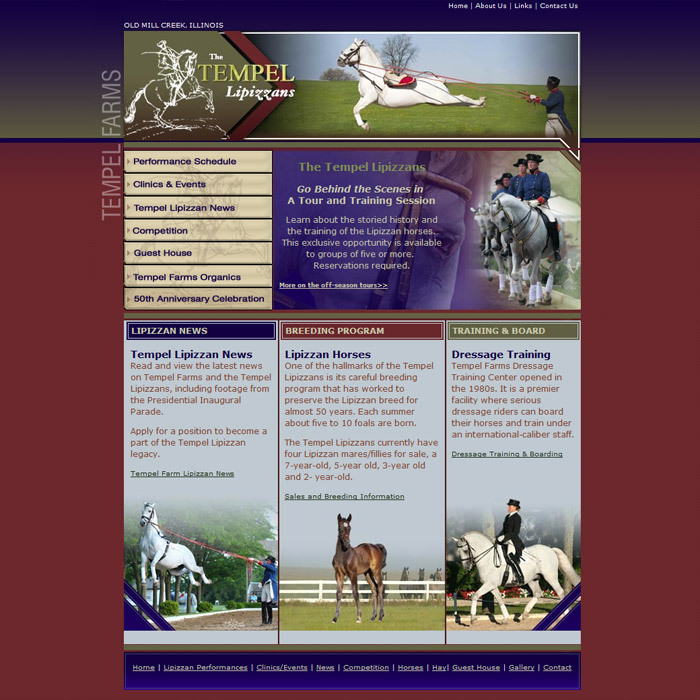 Tempel Farms also opened a premier dressage training facility in the 1980's where serious dressage riders board their horses and train under high-caliber staff. 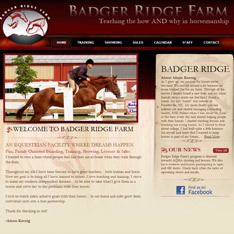 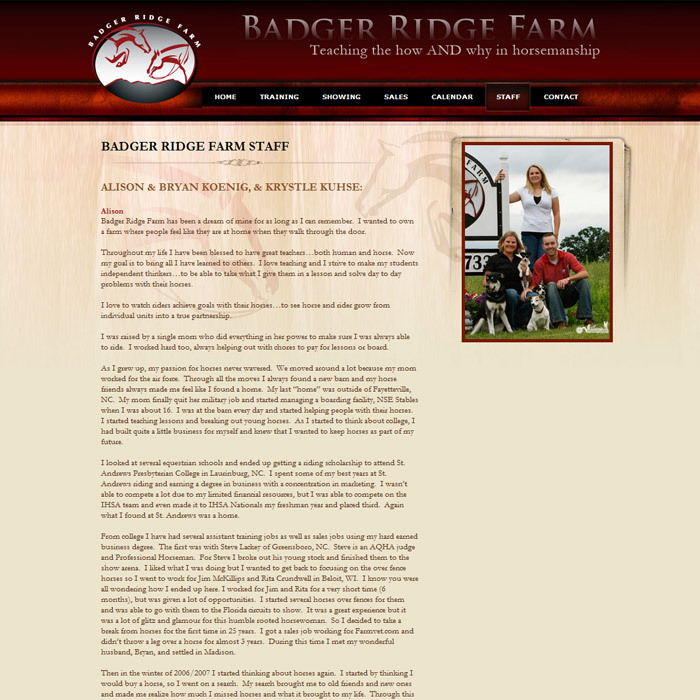 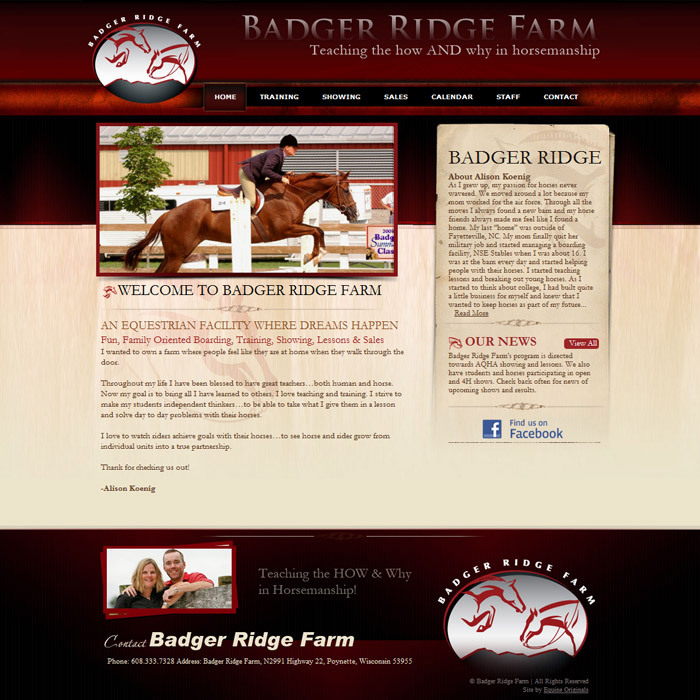 Badger Ridge Farm is an equestrian facility focused on fun, family-oriented boarding, training, showing, lessons, and sales. 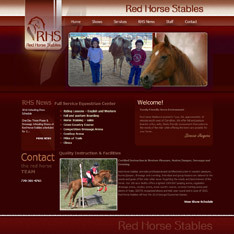 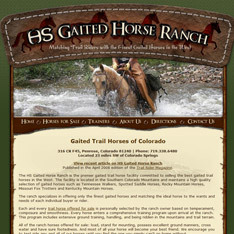 Their goal is to see horse and rider grow from individual units into a true partnership. Located on thirty acres of oceanfront pastureland in Hawaii. 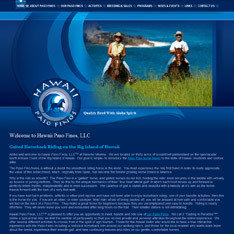 Hawaii Paso Finos are the smoothest riding horses in the world because of their unique gait. Steinburg is Trakehner performance and breeding stallion owned by Ann McMillan. 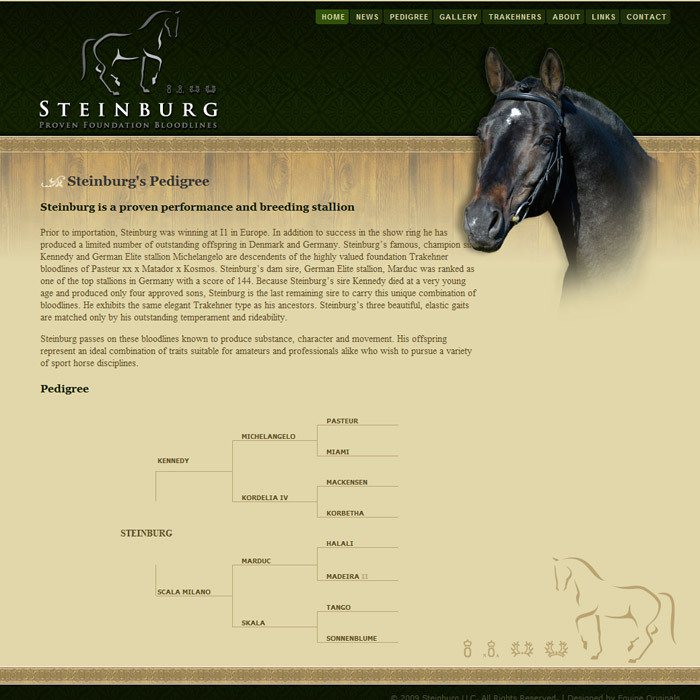 Steinburg embodies all the qualities knowledgeable breeders look for in a sport horse stallion. 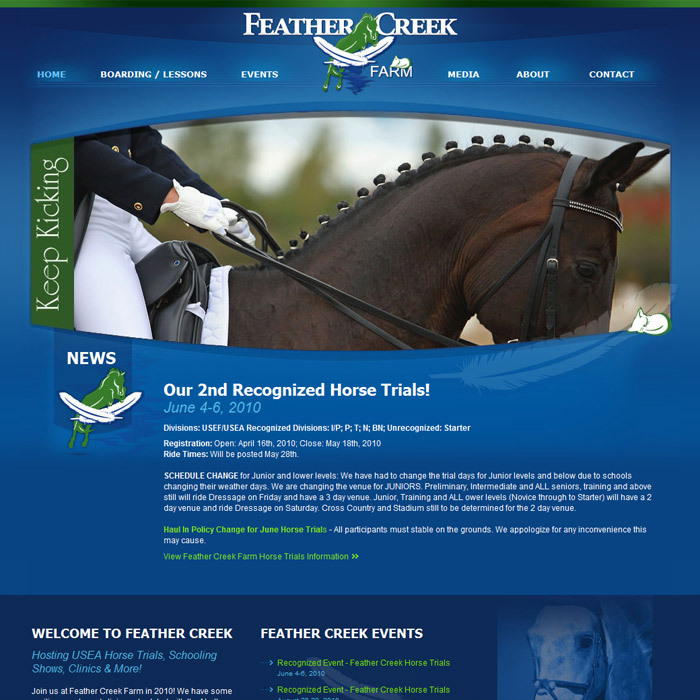 Focusing on horse boarding, lessons, and events, Feather Creek Farm is a phenomenal eventing facility in Norman, Oklahoma. Derby Fences are strong, durable, aesthetically beautiful, easy to clean, stain resistant and virtually maintenance free for years. 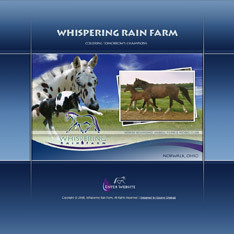 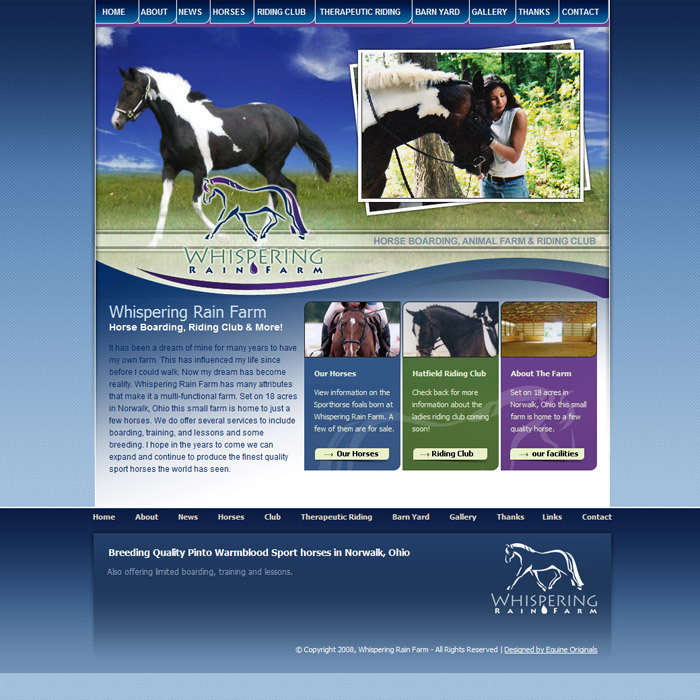 Whispering Rain Farm is a horse boarding, animal farm, and riding club farm. 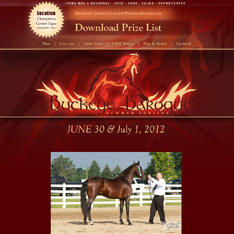 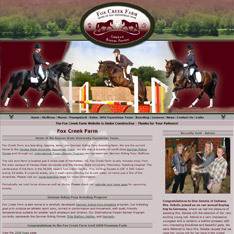 They focus on breeding quality pinto Warmblood sport horses in Norwalk, Ohio. 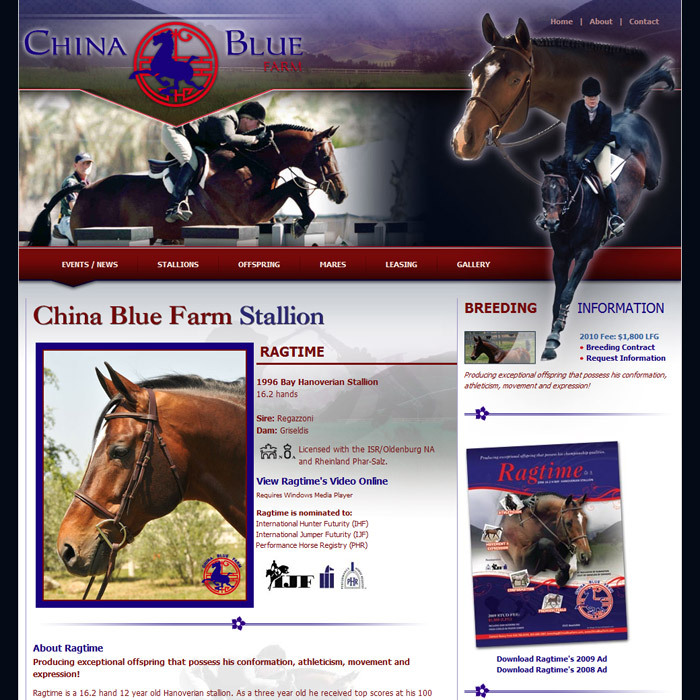 China Blue Farm is devoted to breeding and developing top hunter/jumpers on the West Coast. 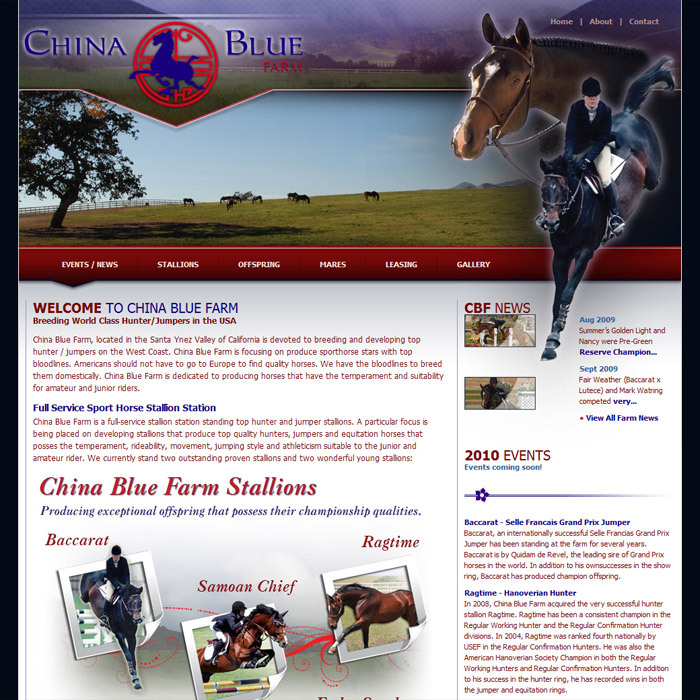 China Blue Farm stands proven stallions: Ragtime, Baccarat, Fair Weather, Samoan Chief and Fudge Sunday. 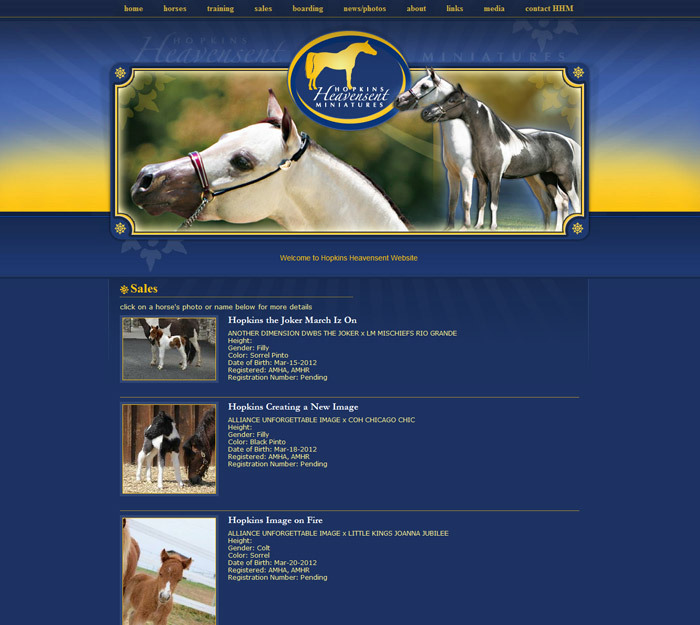 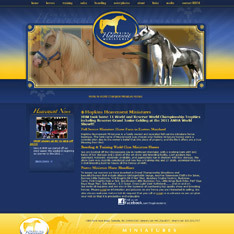 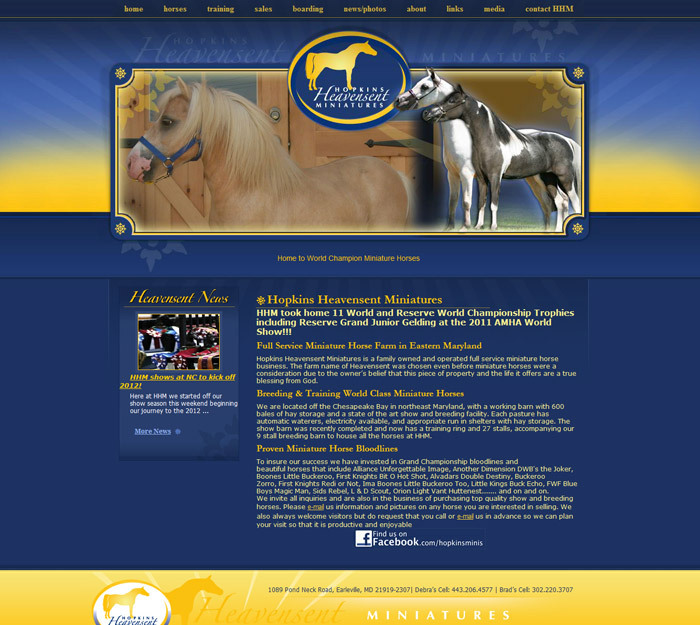 Hopkins Heavensent Miniatures is a family owned and operated full service miniature horse business located off the Chesapeake Bay in northeast Maryland, equipped with high quality facilities. 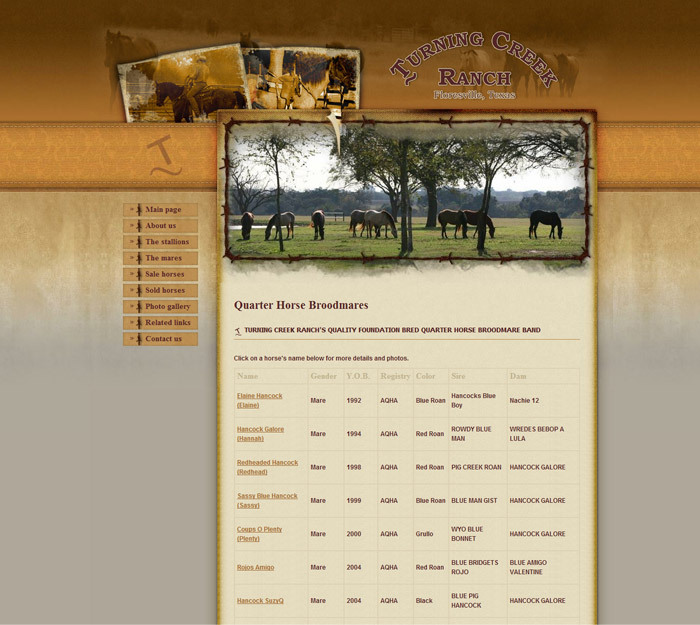 Turning Creak Ranch, located southeast of San Antonio, Texas, specializes in maintaining and preserving quality roan foundation bred quarter horses. 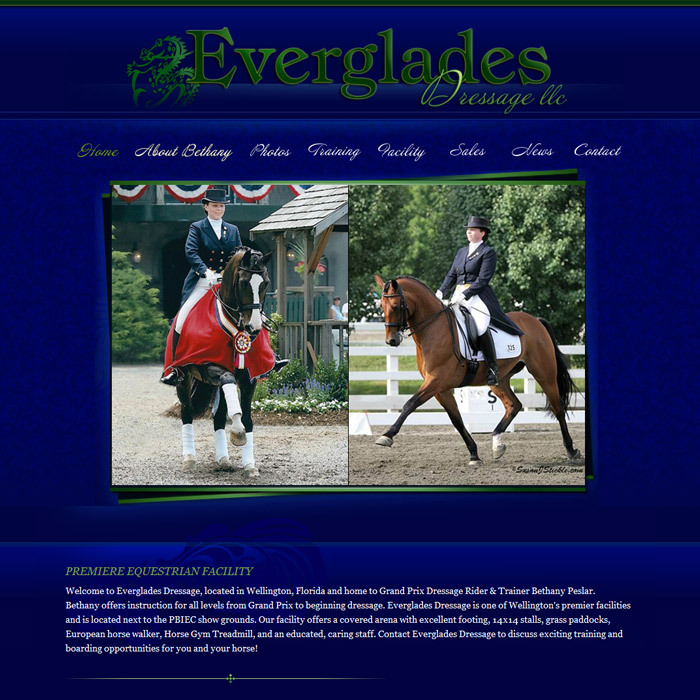 Everglades Dressage, home to Grand Prix Dressage Rider & Trainer Bethany Peslar, offers instruction for all levels from Grand Prix to beginning dressage at their premier training and boarding facilities located in Wellington, Florida. 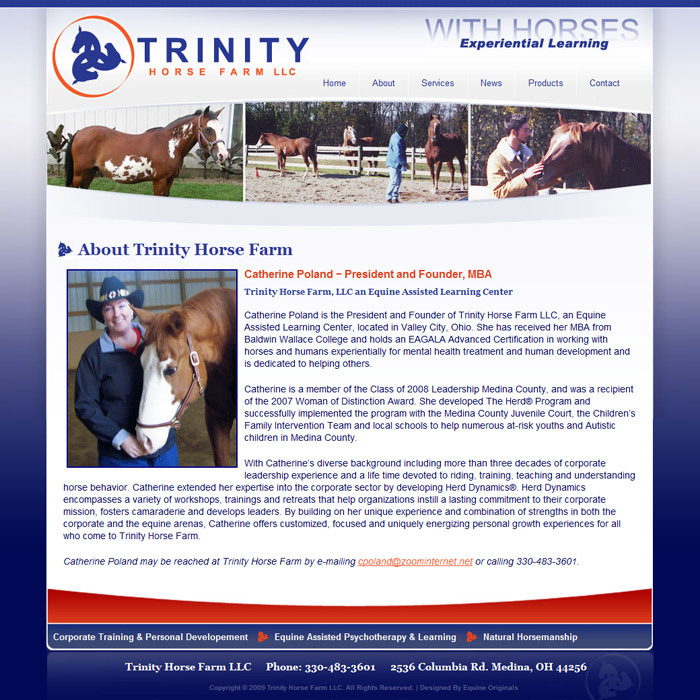 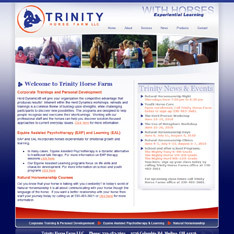 Trinity Horse Farm focuses on horse training through offering natural horsemanship courses, herd dynamics workshops, Equine Assisted Psychotherapy and Learning. 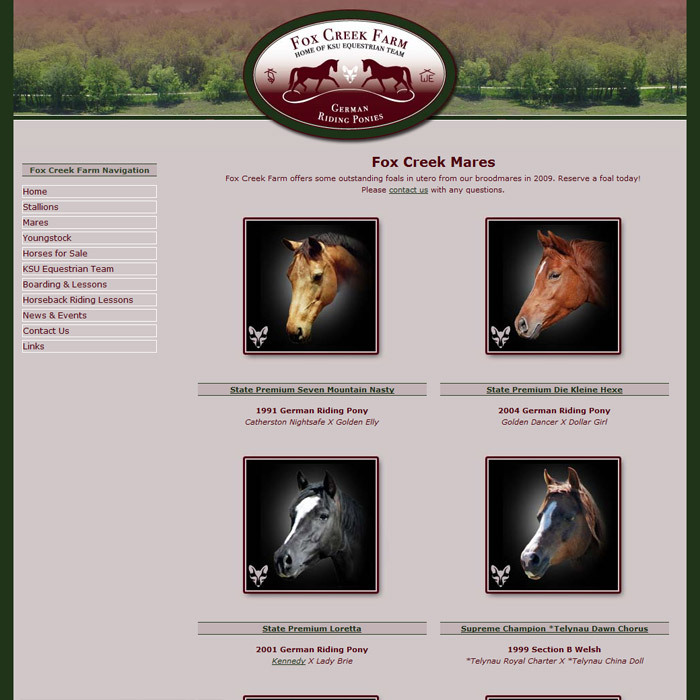 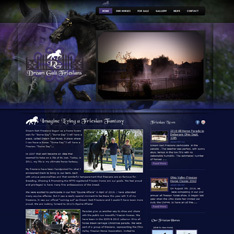 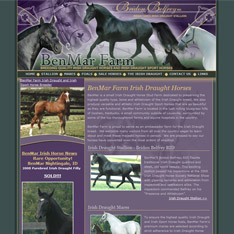 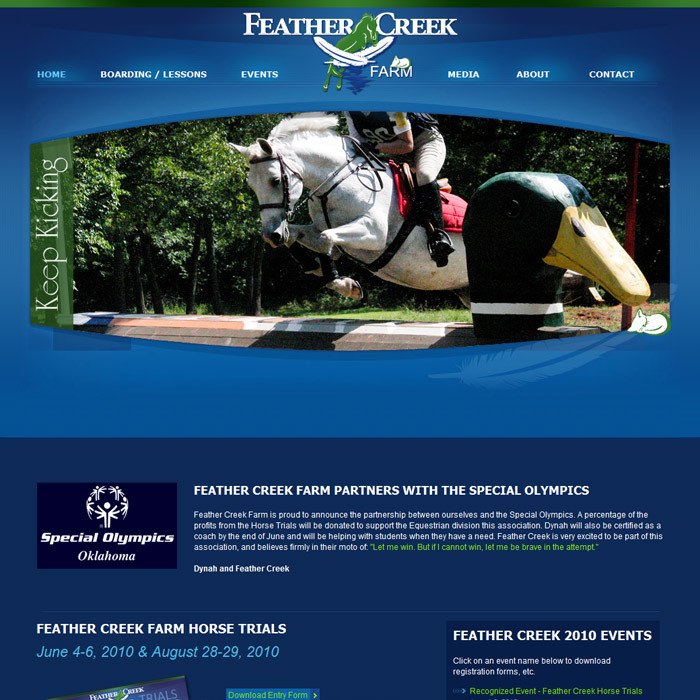 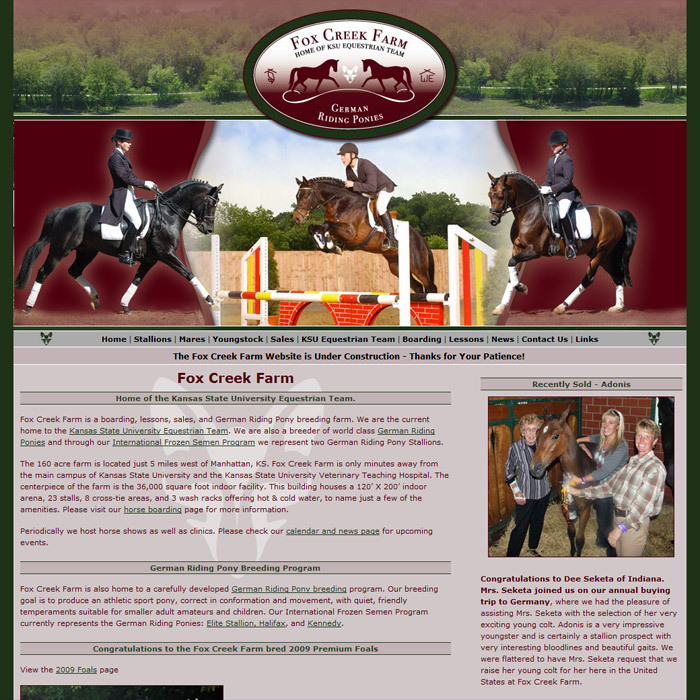 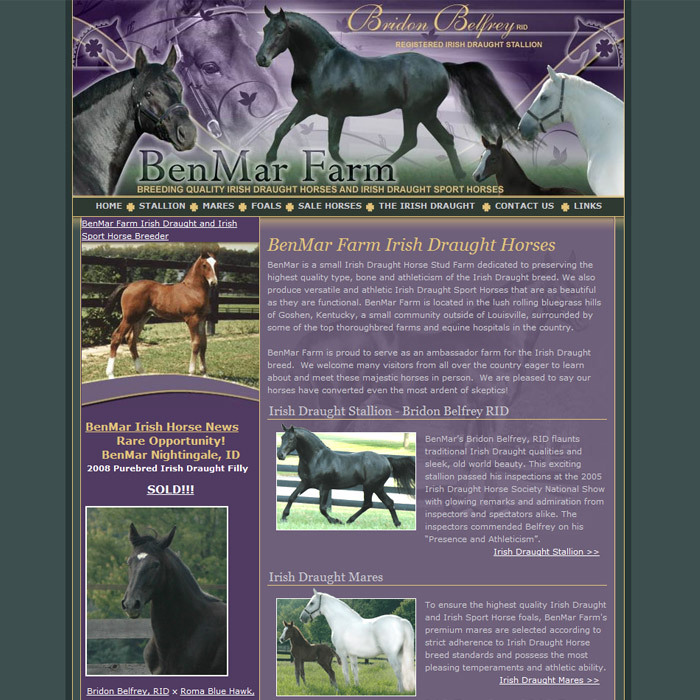 Fox Creek Farm is a boarding, lessons, sales, and German Riding Pony breeding farm. 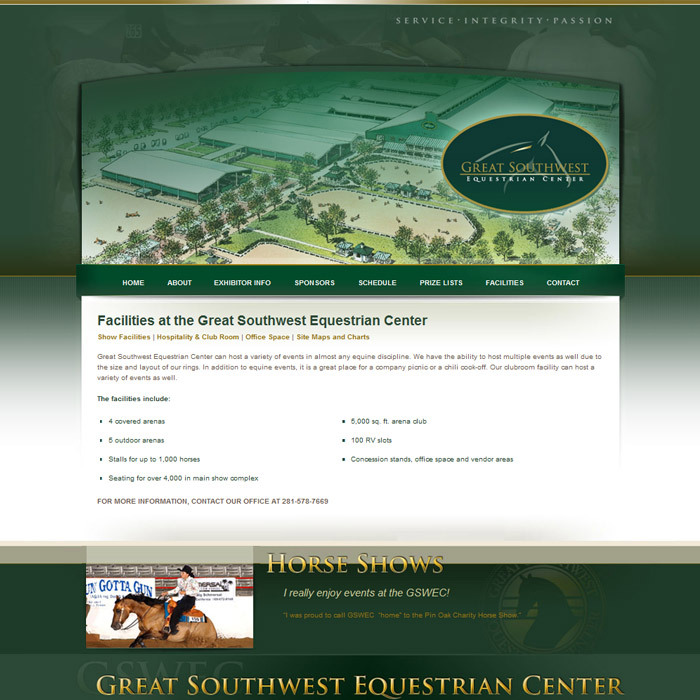 Outfitted with nice facilities, the centerpiece of the farm is the 36,000 square foot indoor facility. Looking to turn your business around or give your old site a facelift? 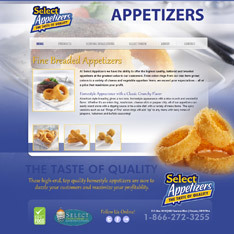 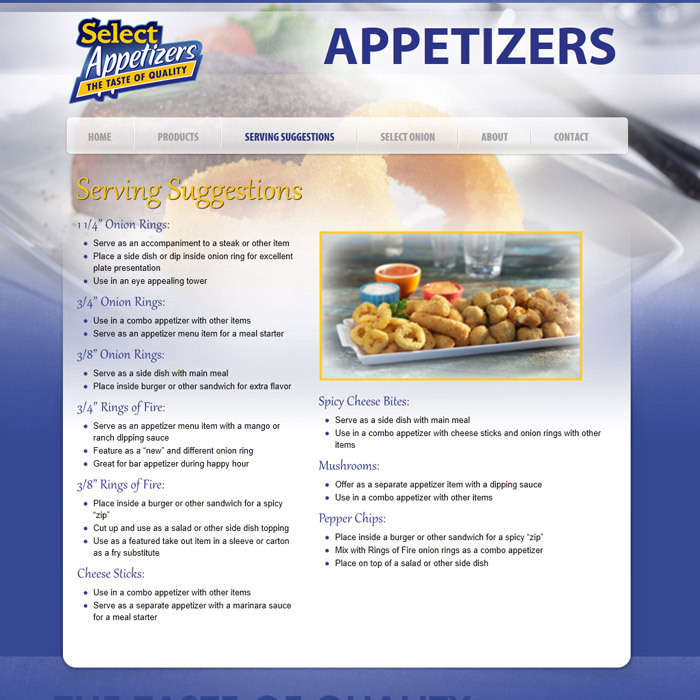 Select Appetizers offers the highest quality, battered and breaded appetizers at the greatest value to customers. 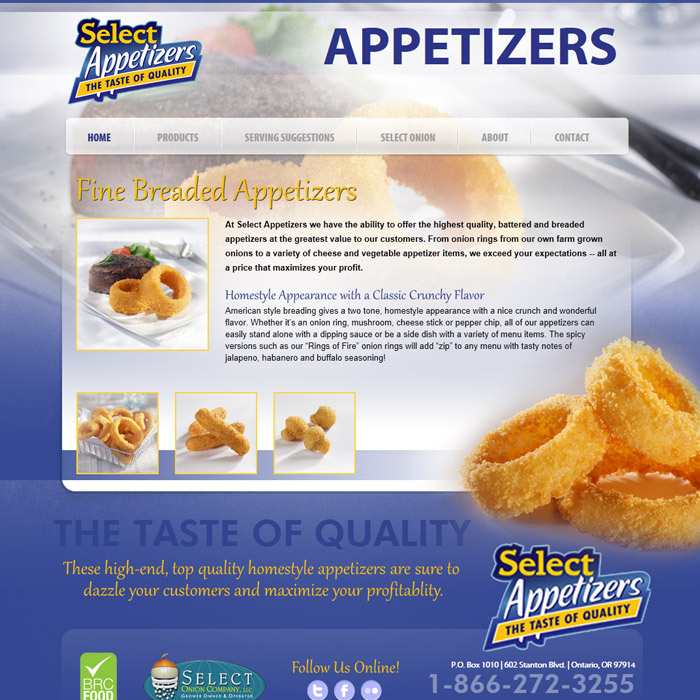 From onion rings to a variety of cheese and vegetable appetizers, they specialize in exceeding expectations, all at competitive prices. 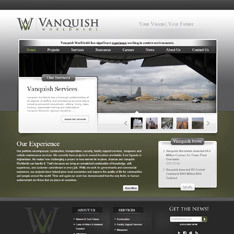 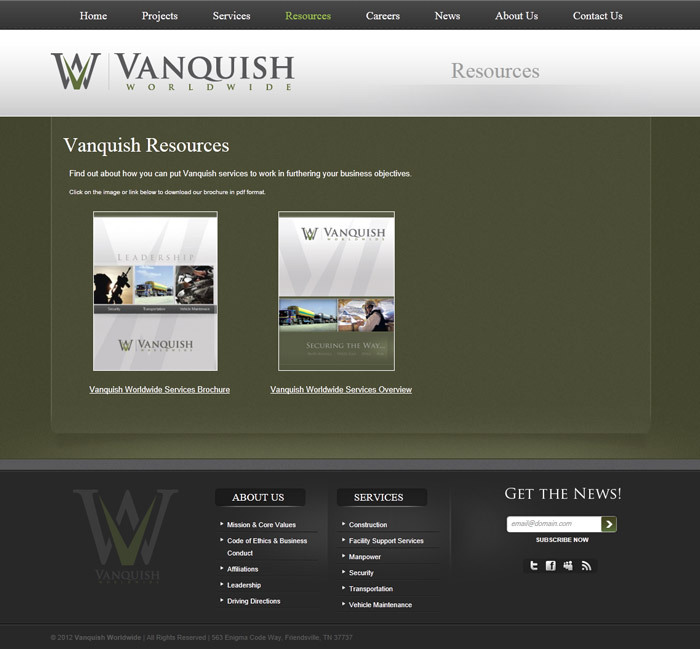 Vanquish offers exceptional mobilization and logistic services in austere, overseas environments. 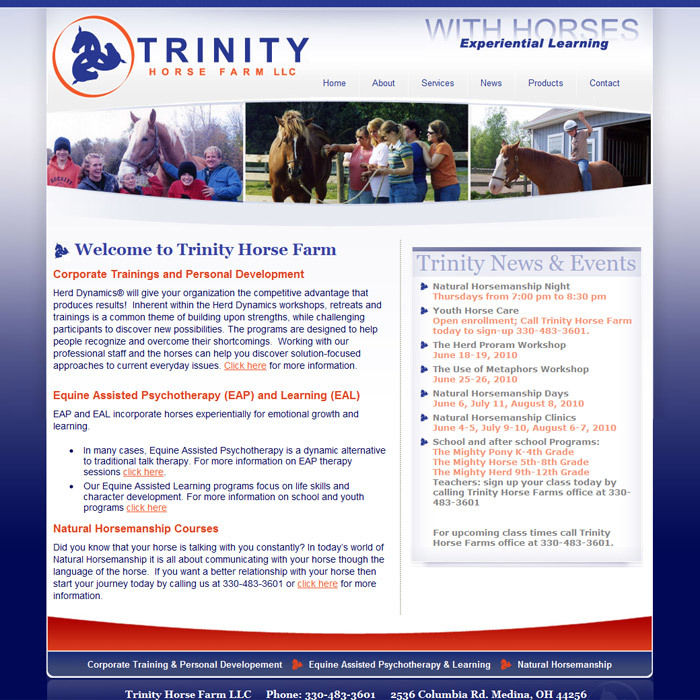 With a highly qualified team of more than 60 years combined experiencee, they have what it takes to fulfill contracts and get the job done. 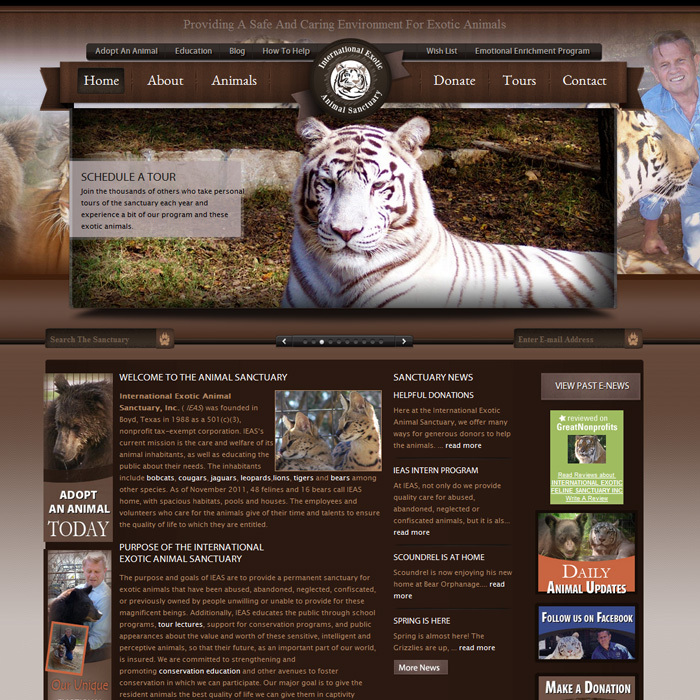 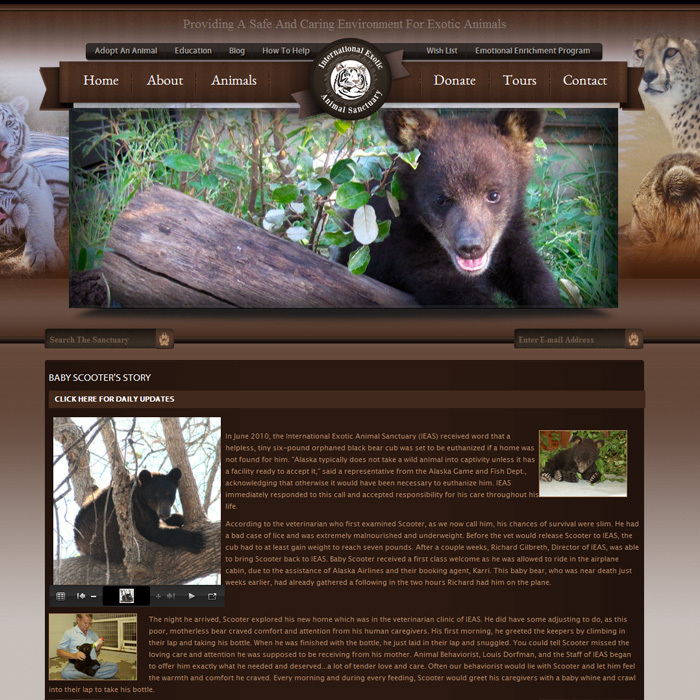 International Exotic Animal Sanctuary in Boyd, Texas, exists to care for exotic animals that have been abused, abandoned, confiscated, or neglected by previous owners, as well as educating the public about their needs.